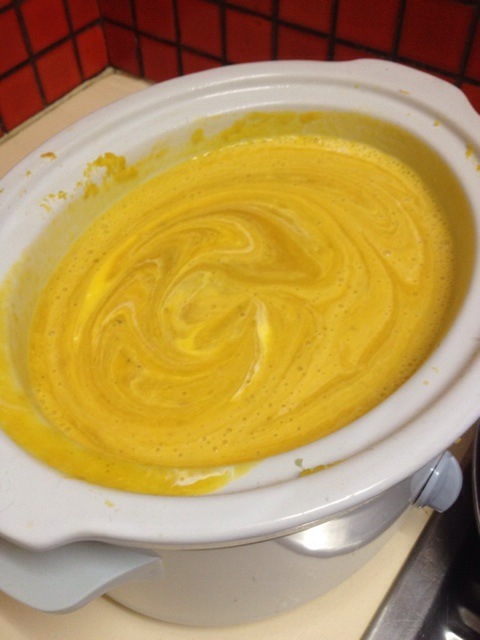 Since having some leftover pumpkin at Christmas that I ended up throwing away I have wanted to try and make pumpkin soup. 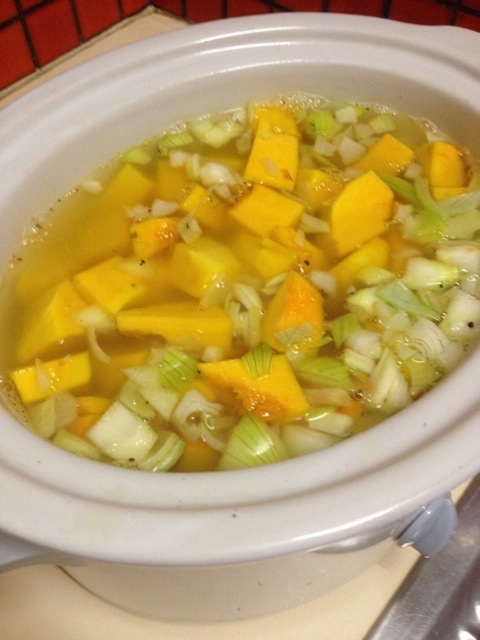 I bought some pumpkin about a week ago and then picked up some sweet potato when we went shopping last and decided I would have a go at making the soup in my slow cooker. I googled lots of different recipe ideas and decided to try the following recipe which I kind of made up from lots of different recipes but which worked really really well! 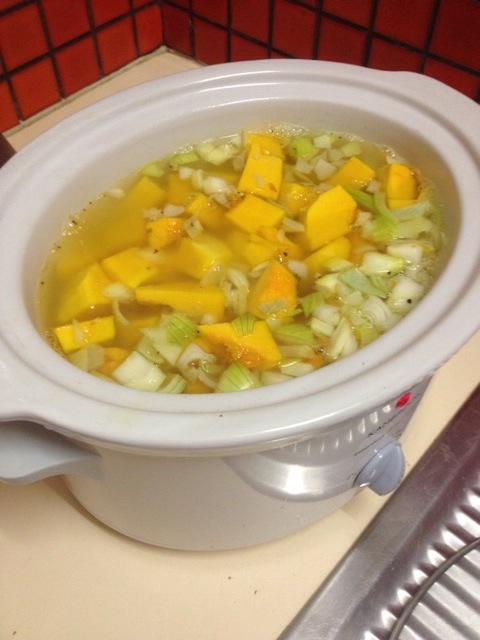 Peal and Chop the pumpkin, sweet potato and onion and line the bottom of the slow cooker. Mix the stock pots in a jug with 3 cups of boiling water and add salt and pepper to taste. I then cooked the ingredients of the high heat setting for 4 hours before mashing the ingredients up and leaving it to cool overnight. 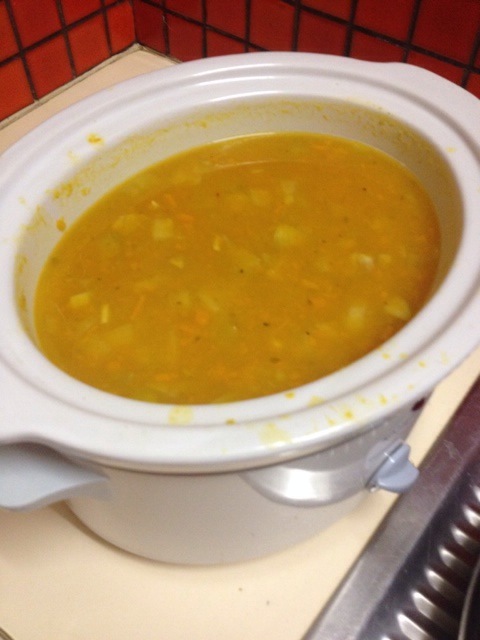 When your getting ready to serve it put the liquid through the blender and back into the slow cooker along with the cream and heat it on the hight heat setting for an hour until fully reheated and then serve. 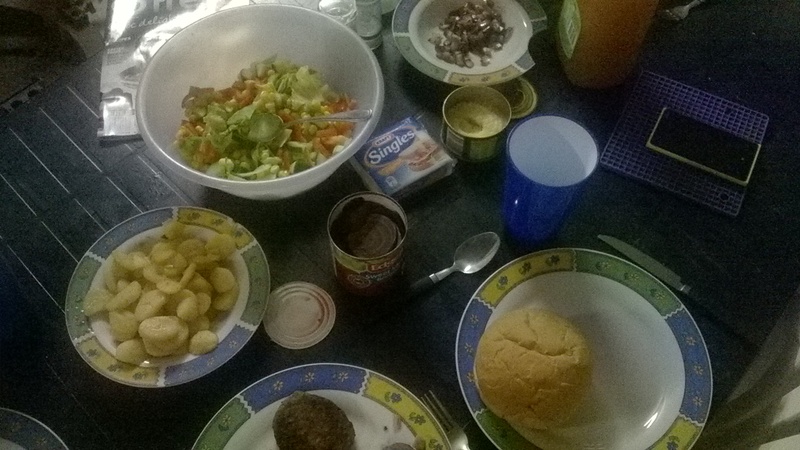 I really enjoyed my experimental recipe and the Aussie and our friend who came to dinner like it too I think! Unfortunately I forgot to take a photo of the finished result but this is it mid cooking! I’ve been in Darwin for just over a year now and until 2 weeks ago the fact that we often wouldn’t get home until 6.30/7pm evening and that I only had a BBQ to cook with meant I was a lazy cook trying to cook the easiest and quickest things possible with little experimentation. I’m actually far too excited about the fact we have a cooker with an oven AND a grill. We also bought a slow cooker which meant I can try to recreate the delicious stews my mum makes as well as casseroles and the like. Reading this blog post on the Smitten by Britain blog today really got me thinking about the foods I miss from the UK and the dishes I’ve cooked that remind me of home and my mums amazing cooking. 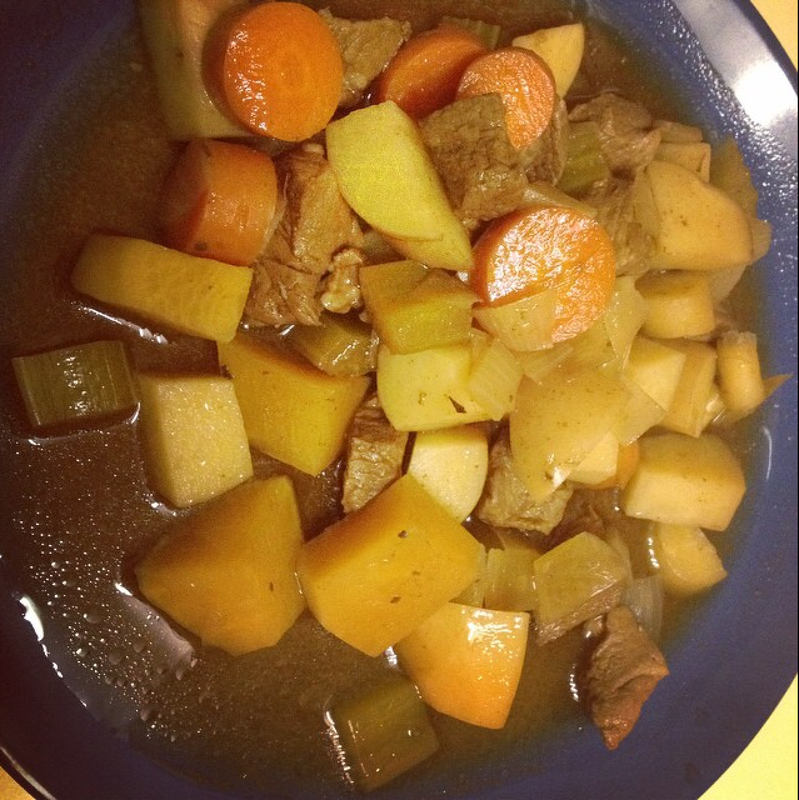 Every winter at home in the UK means stew season and on the weekends I’d often wake to the smell of my mums beef stew being cooked ready for re-heating at lunchtime or for dinner. This stew tastes fantastic the first time it’s cooked but is even better when re-heated especially with dumplings! I made a Darwin version although called it a casserole as seems strange to call it stew and to be eating stew when it’s about 25 degrees. 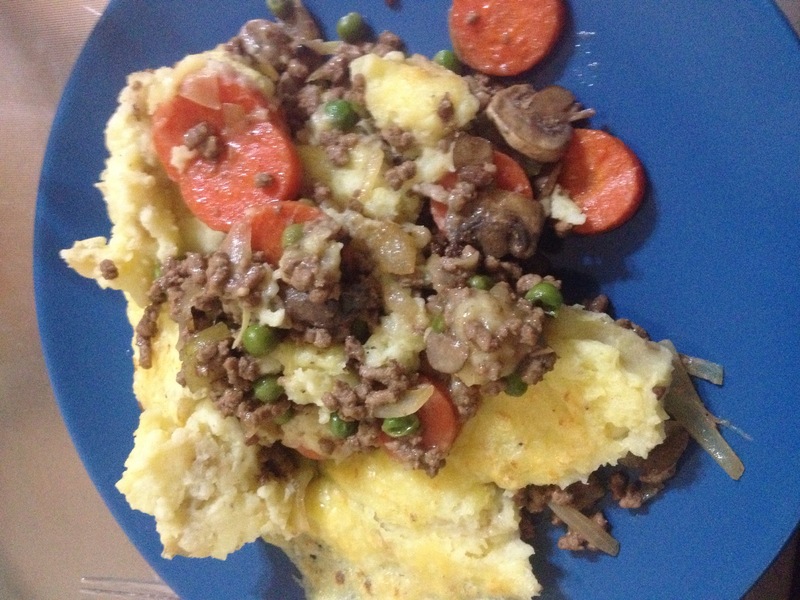 To make the cottage pie I boiled the potatoes and carrots and started them at the same time but only boiled the carrots for about 10 minutes. Next I cooked the minced beef until it was brown, added the onions and mushrooms until cooked then added the stock, Worcester sauce, water along with the carrots and peas and simmered this until the stock reduced. Once cooked I spooned it into an oven dish and mashed the potatoes with butter and pepper adding a drop of milk at the end. 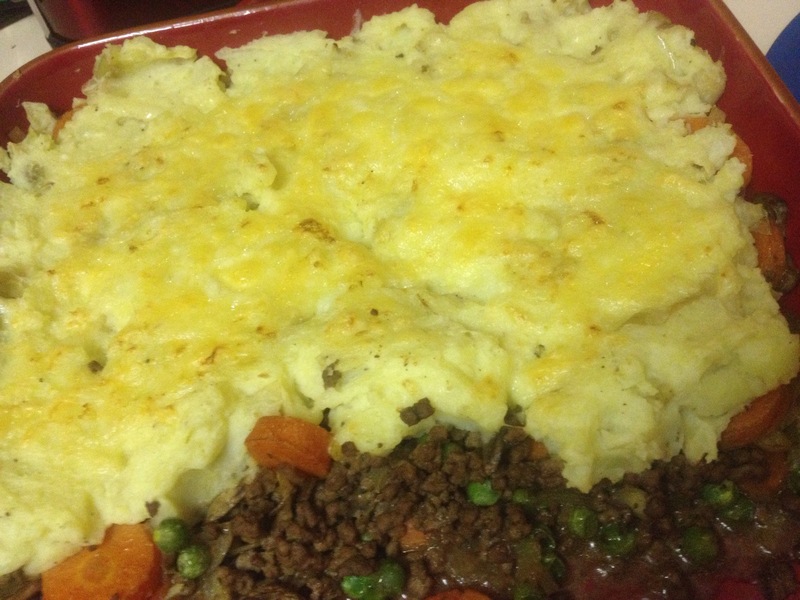 Once mashed I spooned it on top of the mince mixture and spread some grated cheese on top before placing the oven dish into the pre heated grill for about 10 minutes before serving. This was a great home cooked meal and I’m looking forward to trying some when I get home in just 23 DAYS!!!! 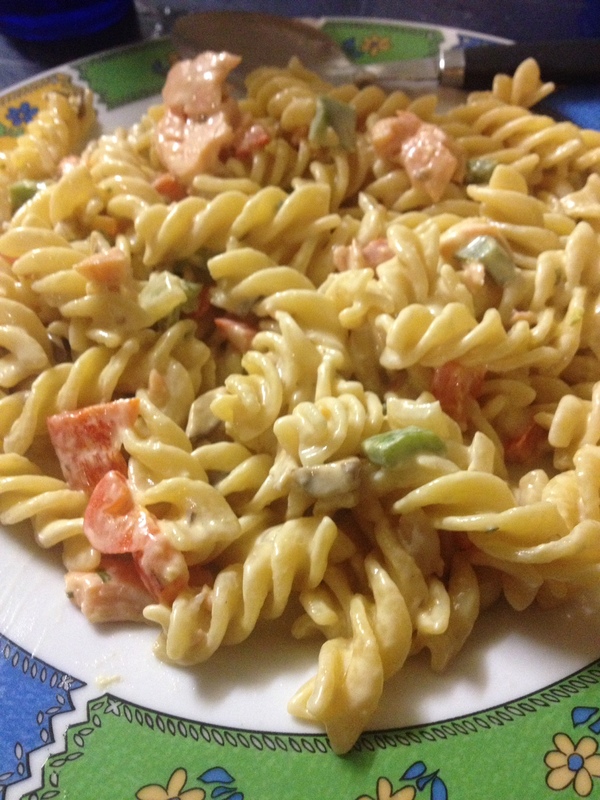 In this post I mentioned that I had tried a delicious Salmon pasta at a restaurant in Darwin and wanted to give it a try and on Saturday night I gave it a go. I’m not too confident on following recipes as I worry I will get them wrong or it won’t taste very nice because I’ve never tried it before. I also tend to use lots of pre-packaged mixes like pasta sauce rather than try to create it myself as we don’t really have a way of storing the ingredients you would need and it would be too expensive to keep buying them every time. I started off by following this recipe or at least that is the one I found online standing in Woolworths trying to work out what ingredients I would need. When I looked a bit more I liked the look of this recipe as well so this dish is a bit of a combination of the two! A handful of mushrooms roughly copped. 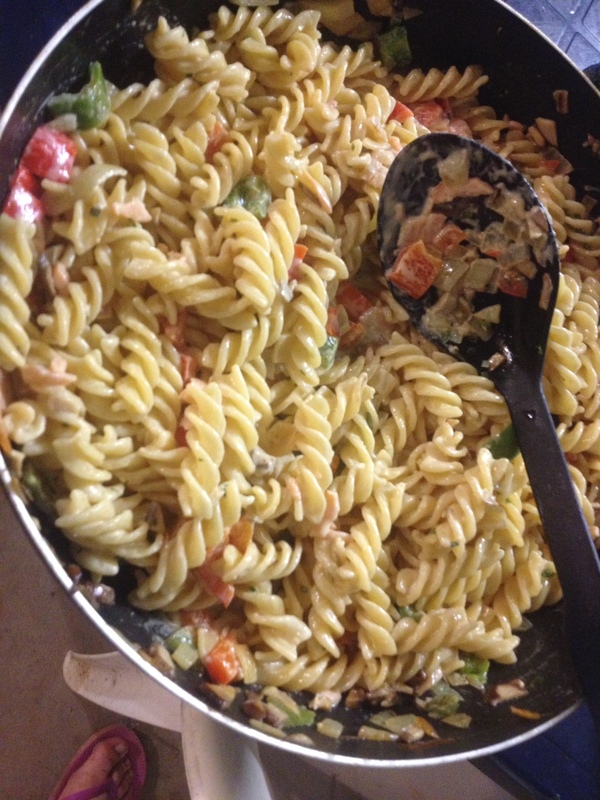 I cooked the pasta and whilst it was cooking chopped up the peppers, mushrooms, onion and salmon into smaller pieces. Then when it was cooked I used the olive oil spray to cook the peppers mushrooms and onion altogether in the frying pan until softened. 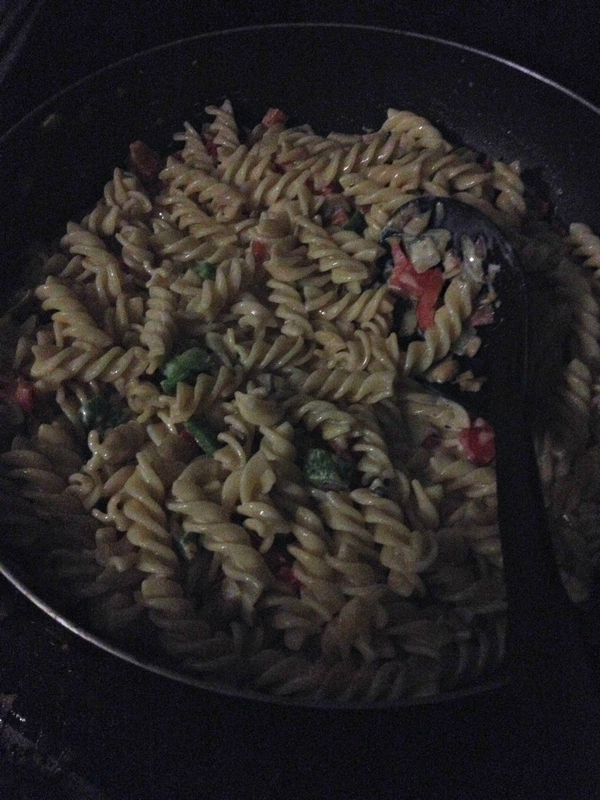 Then I added the pasta which had been drained back in to the pan and cooked it for a minute with the vegetables before adding all of the cream and cooking for a further minute making sure all of the ingredients were cooked in the cream. Next I added the garlic paste, lemon juice and chives in to the mixture and cooked for a further minute. Finally I turned the heat off and in the salmon leaving it to cook for about a minute before serving it up. 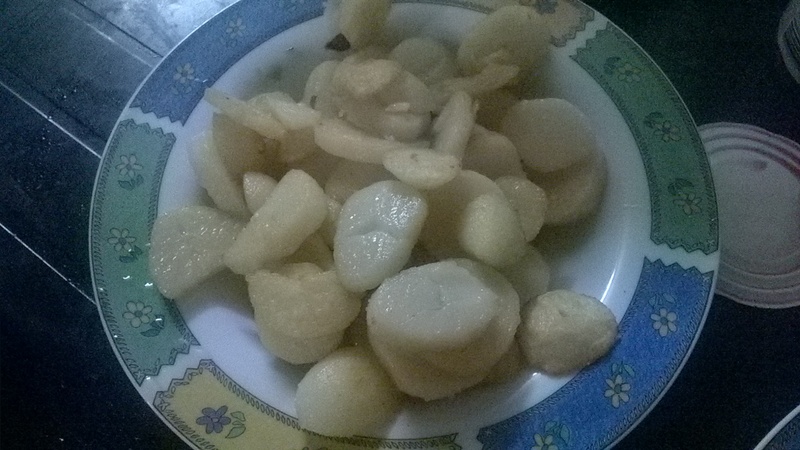 The final result was good, it wasn’t like the version I had tried during the week but I think that was because I had added lemon to the dish and I am definitely not a chef. It was tasty and full of flavour which was good as I worried it would taste a bit bland. I might experiment a bit and leave out the lemon next time but we quite enjoyed it and there are left overs which will definitely be eat up over the next few days! 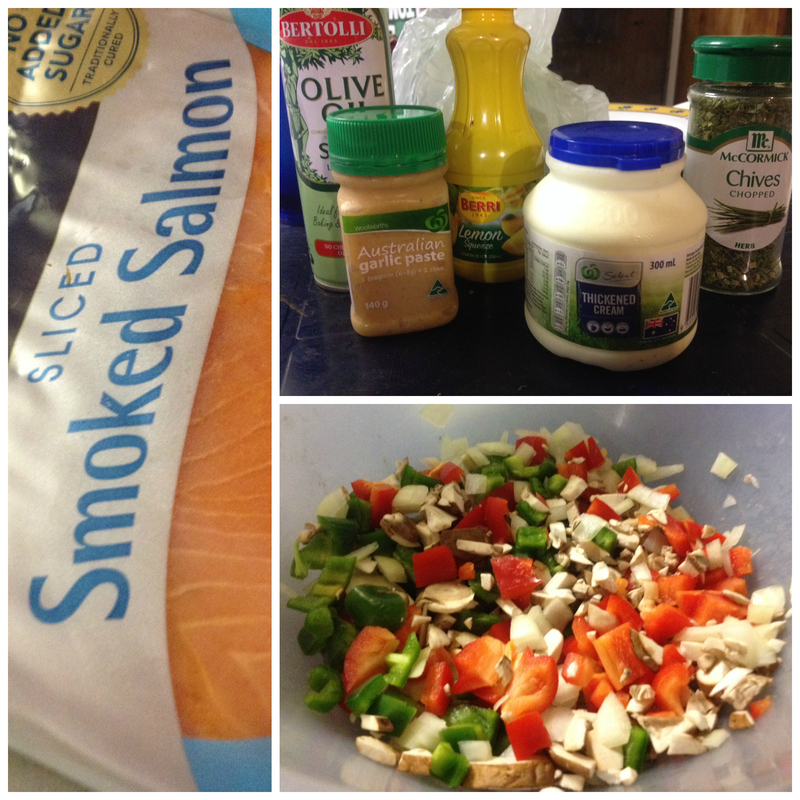 I haven’t done one of my “outback recipes” for a little while now so thought today’s dinner might be a good one for an update. I don’t know if there is such a thing as an Aussie Burger but when I first visited Australia I had a burger which was very similar to this and called an Aussie Burger and so every often I make it for us. 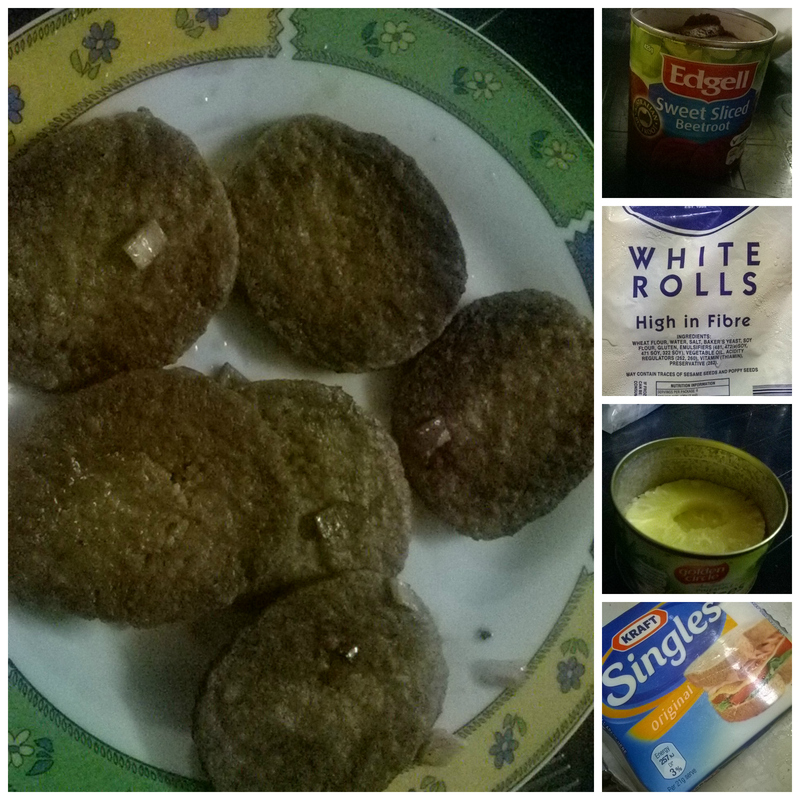 It seems a bit weird because of some of the ingredients but actually tastes so good, it’s definitely comfort food. Then just cook the burgers on the BBQ and pile them up with the other ingredients in the bun. 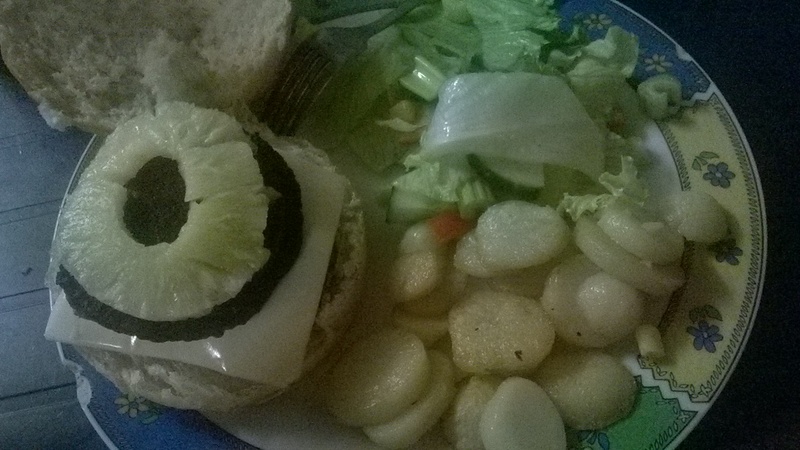 I chose a slice of beetroot followed by a burger then slice of cheese, burger and slice of pineapple. You can add sauce like ketchup but it has quite a lot of flavour without the sauce. For the chips I just bought a tin of pre cooked potates sliced them up into pieces and fried them in oil in a pre-heated frying pan. I’m sure a chip pan would work as well but you’d have to be careful they don’t over cook as the pieces are quite small. 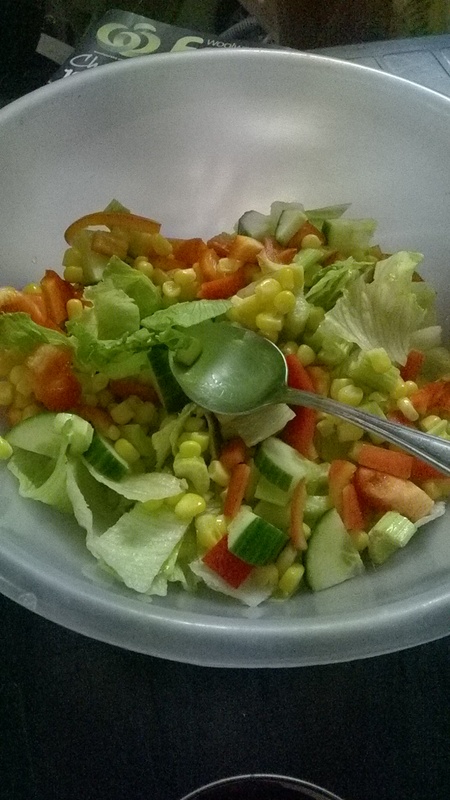 Finally I served it with a mixed salad and everyone dug in!